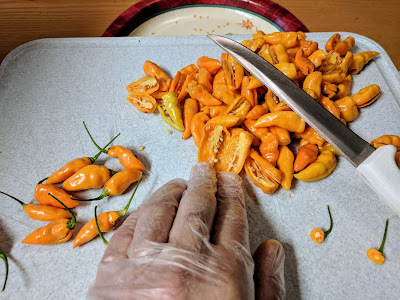 PURE FLORIDA: FRESH TRUE DATIL PEPPER SEEDS FOR 2019 GARDEN!. CLICK HERE! THIS UPDATE IS BEING POSTED ON MARCH 30, 2019. ORDER YOUR SPRING 2019 DATIL PEPPER SEEDS NOW! Scroll down for instructions on 3 different ways you can order your seeds. These are fresh picked ripe datils being seeded. I have plenty of these fresh seeds for your 2019 gardens. I GROW NO OTHER PEPPER VARIETIES AND I ONLY CHOOSE THE BIGGEST AND RIPE DATIL PEPPERS FOR SEED SALES. THE PACKETS WILL CONTAIN 30+ SUPER FRESH 2018 SEEDS. THE PRICE WILL REMAIN $5.00 FOR 30+ REAL DATIL PEPPER SEEDS AND A PAIR OF SAUCE RECIPES. THANK YOU FOR YOUR INTEREST AND FEEL FREE TO EMAIL ME WITH ANY DATIL QUESTIONS. PLEASE NOTE, THESE ARE THE REAL DATIL. THE SEEDS I SELL ARE THE DATILS PASSED FROM MY GRANDFATHER TO MY DAD AND THEN TO ME. ALSO, I GROW THEM IN ISOLATION FROM ANY OTHER PEPPER VARIETIES TO AVOID ANY CHANCE OF CROSS POLLINATION. YOU CAN FIND MY SEEDS ON EBAY, JUST LOOK FOR THE PURE FLORIDA DATIL PEPPER SEEDS ADVERTISEMENT. MINE ARE 100% ST. AUGUSTINE ORIGIN DATILS. THE FOLLOWING IS A BIT OF HISTORY AND TIPS ON GROWING DATIL PEPPERS. FOR YEARS, THE DATIL PEPPER HAS BEEN THE TRADITIONAL PEPPER OF MY HOME TOWN, ST. AUGUSTINE, FLORIDA. WE ST.AUGUSTINIANS ARE FOND OF SAYING, "DATILS ONLY GROW HERE", BUT THAT'S A MYTH. THEY WILL GROW ANYWHERE THAT YOU CAN GIVE THEM GOOD PEPPER GROWING CONDITIONS ... WARM DAYS, NO FROSTS, NOT TOO MUCH FERTILIZER, AND WARM, BUT NOT TOO HOT EVENINGS. START AND GROW THEM THE SAME WAY YOU WOULD ANY VARIETY OF PEPPER. THERE ARE TONS OF WEBSITES WITH INFORMATION ON STARTING PEPPERS AND OTHER VEGGIES, SO JUST GOOGLE IT IF YOU HAVEN'T DONE THIS BEFORE. IN RETURN, I WILL SEND YOU TWO DATIL PEPPER SAUCE RECIPES AND A PACKET OF 25+ SEEDS. My first tray of baby datils for the 2013 season. Planted on February 18, 2013 in Miracle Gro seed starter mix and home compost/sand mixture. Almost 100% germination by February 27, 2013. My seeds are the real thing and they are vigorous! DATIL PEPPERS. THE ORANGE PEPPER IS FULLY RIPE, BUT THE GREEN ONES ARE READY FOR USE. THE PURPLE COLORATION IS COMMON, BUT NOT PRESENT ON EVERY PEPPER. A BIG DATIL. THEY ARE SMALL AS PEPPERS GO, NOT TINY, BUT SMALLER THAN JALPAPENOS AND THE SURFACE IS NOT SMOOTH. THE ARE SIMILAR IN HEAT TO HABENERO'S BUT HAVE GREAT FLAVOR.